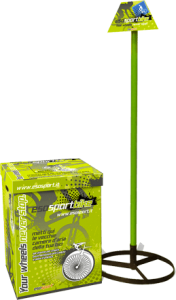 Participation in the esosport bike project consists in a year’s subscription, which includes the delivery and installation of the Starter Kit. In the course of the year ESO will take care of picking up the full container and compiling the necessary collection and transport forms. Advertising activities are carried out to give visibility to the new member store through initiatives of the press office and through the social media. An e-mail address and tollfree phone number are at the complete disposal of members for technical and commercial assistance. The name of the store is listed in the relative section of the website as a collection point.